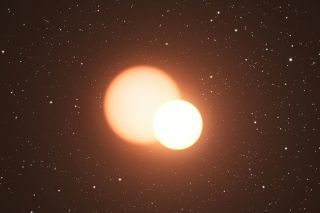 Artist's impression of an eclipsing binary system that including a pulsating star called a Cepheid variable. Researchers have recently discovered a new type of variable star that pulsate in two frequencies, the ratio of which is surprising close to the famous "divine proportion." Mysterious "golden stars" that pulsate in a fractal way have scientists stumped. Although these stars were spotted during a search for an extraterrestrial galactic Internet, the researchers say intelligent aliens have nothing to do with their flickering patterns, as far as they can tell. As a byproduct of its extraordinarily successful hunt for exoplanets, NASA's Kepler space telescope also precisely tracked the brightness of 150,000 stars nearly continuously for four years. These include two kinds of variable stars known as Cepheids and RR Lyrae stars. These stars regularly brighten and dim when they swell and shrink in size, depending on the way heat and pressure rise and fall within them. "Cepheids tend to be big and very much brighter than the sun, while RR Lyrae stars tend to be a bit smaller than the sun but still brighter," said study co-author John Learned, a neutrino physicist at the University of Hawaii at Mānoa. A few years ago, Learned and his colleagues began investigating Cepheids for an unusual reason — to see if aliens might use them to send messages in what they called a "galactic Internet." Firing high-energy particle beams at a Cepheid variable could heat its core and make it brighten early in a way the researchers suggested could be used to encode data. "In the course of this cuckoo study, we found stars that behaved in funny ways," Learned said. Most variable stars appear to brighten and dim following just one frequency, such as every two hours or every three days. However, Learned said that up to about 10 percent of Cepheids and RR Lyrae stars pulsate according to two different frequencies, much like a drummer tapping two different beats. Now, surprisingly, scientists have found that the ratio between these double beats in many of these variable stars is strangely near the golden ratio, a number that Renaissance artists such as Leonardo da Vinci often thought embodied ideal beauty. The golden ratio is a number found by dividing a line into two parts so that the longer part divided by the smaller part is also equal to the whole length divided by the longer part. Specifically, the golden ratio is equal to about 1.618, although like pi, its digits go on and on, theoretically into infinity. The ancient Greeks knew about the golden ratio, which is also called the golden mean and the divine proportion. In art, the golden ratio has arguably been found in monuments such as the Great Pyramid of Giza. For instance, the ratio of the length of each of its base's sides to its height is about 1.5717, close to the golden ratio. The golden ratio can also be found throughout nature — in the way nautilus shells curve, and how seeds pack onto strawberries, and the shapes of hurricanes and spiral galaxies. Like pi, the golden ratio is irrational. This does not mean these numbers do not listen to reason — in mathematics, an irrational number is one that cannot be written as a ratio of whole numbers such as 1 or 2 or 3. The golden ratio is actually the most irrational number, as it is the least able to be expressed as a ratio of whole numbers. The scientists focused on the RR Lyrae star KIC 5520878, a blue-white star about 16,000 light-years from Earth in the constellation Lyra. They found it pulsed in brightness in two frequencies, one 4.05 hours long and the other 6.38 hours long. The ratio between these frequencies is nearly the golden ratio. So far, the researchers have discovered a few dozen variable stars that also follow this unusual pattern, which they dub "golden stars." The patterns that emerge from these pulsations have what are known as strange attractors, meaning they have a fractal geometry — never-ending patterns that look the same at every scale, from the smallest to the largest. For instance, natural phenomena such as coastlines, mountains, clouds, broccoli, lungs and galaxies may look random in structure but in fact are fractal. Systems with strange attractors are often chaotic in nature, meaning the way they evolve is very sensitive to their initial conditions. Over time, it becomes virtually impossible to predict how chaotic systems like the weather will evolve, a phenomenon that has been termed the "butterfly effect" (because a butterfly beating its fragile wings in the rainforest could theoretically set a storm in motion thousands of miles away). However, these variable stars appear to be nonchaotic strange attractors, whose behavior lies somewhere between consistently repeating patterns and chaos. Strange nonchaotic attractors have never before been seen in nature, only in lab experiments involving topics such as electronic circuits and glowing neon, the researchers said. And what makes these stars behave this way? "We don't bloody know," Learned told Space.com. "We don't have any stellar models that predict this kind of behavior." One possible answer lies in how past laboratory studies have revealed that systems with two frequencies are most resistant to disturbances when the ratio of those frequencies is the golden ratio, lead study author John Lindner, a physicist at the College of Wooster in Ohio and the University of Hawaii at Mānoa, told Space.com. This could mean that when a star pulsates in two frequencies, the most stable outcome is for them to become golden stars. "We now need scientists to create 3D models to test these ideas," Learned said. So are these golden stars the result of alien interference? "Not as far as we can tell," Learned said. "As far as we can tell, these are just weird stars." The scientists detailed their findings online Feb. 3 in the journal Physical Review Letters.